As a follow-on to my other “Re-enactorism Busters” posts, and in particular, the one about boar tusk pendants, this post looks at the evidence for male necklaces during the Viking period. Given that I have a worldwide audience for this blog, a quick note is necessary; this article is dealing with Western Europe in particular, there may be random finds that contradict this in other places that the Vikings visited, but this is concentrating on the Viking homelands and Western colonies. It is well known that Vikings loved jewellery – graves, hoards and chance finds show us that various decorative personal items in bronze, silver and gold abounded and that they are found across the Viking world. 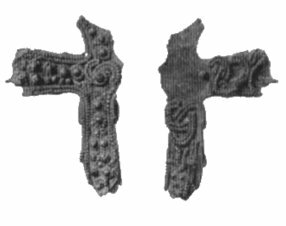 In addition to the pins, brooches and such, there is also a (usually) humbler alternative for the Viking looking to adorn themselves – necklaces. In re-enactment there is a tendency for both male and female pre-Christian Vikings to wear multiple necklaces with all manner of teeth, beads, amulets etc dangling from them. It is recorded that, at least in certain Scandinavian cultures, women wore many beads and were used to show off the wealth of their husbands. However, what about the men? Were they as ostentatious with their wealth when it came to their own jewellery? Beads (usually glass or amber) are one of the most regularly seen additions to necklaces. In the present day they are plentiful, (relatively) cheap and can easily make up a large visual appealing necklace. However, the archaeological evidence from graves does not suggest that they were worn in any great quantity by men. The majority of Viking male graves with beads have only 1, 2 or 3 beads, either worn alone or occasionally with a Thor’s Hammer. 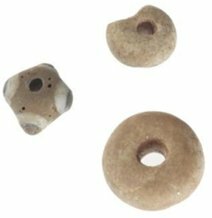 Finds of more than 3 beads in a male grave are exceptionally rare. This is quite a long-standing tradition during the period and can be seen continuously from the Late Iron Age, through the Migration period and into the Viking Age. Given that single beads are frequent finds in male graves, it is possible that they fulfilled a role other than as a necklace. One of the few surviving Viking period tunics known uses a bead as a neck closure and it is possible that the finds of individual or “odd” beads were used in a similar manner. The overwhelming majority of found beads are glass. While other materials such as amber or jet may have been used they are rarer finds. Fig 1: The beads from the young male grave at Balneikeil. (image: http://www.nms.ac.uk/) The large bead in the bottom right could be to close the neck of a tunic rather than be part of the necklace. There are many pendants that can fall under this category, but the majority of finds are Thor’s Hammers. While evidence for male necklaces is sparse in general, where pendants are found, the Thor’s Hammer seems to be the most frequently worn. Other examples that have been found are crosses, miniature strike-a-lights, scythes and weapons (small axe heads etc). However in total these other amulet types have only been found in fewer than 20 graves, so it does not appear that they were at all common. The perforated coins and other possible amulets that are occasionally found in female graves also appear to be lacking in male graves. Even once Scandinavia had largely converted to Christianity, the wearing of necklaces (and particularly amulets) was a predominantly female action. In Birka, only a single grave out of the excavated 1100 contained the body of a man that could be associated with a cross pendant, and a study of male and female graves found only that in a group of 36 amulets attributed to male graves only 2 were crosses. Documentary evidence certainly suggests that women wore them and there is some archaeological evidence to support this. However, that evidence is missing from male graves. In short, there appears to be no direct evidence to show that men wore neck-rings. Evidence for the wearing of neck-rings is somewhat sketchy when compared even to necklaces. Certainly there are plenty of them known from across Western Europe during the period and they may be made from bronze, silver or gold, but the majority are found in hoards though and have no evidence for whoever wore them. Even rarer than pendants themselves are the cords used to wear them. The evidence from graves would suggest that most of the pendants (if not all) were suspended on a perishable organic cord rather than a metal chain. The evidence from male Viking burials would suggest that necklaces were not commonly worn by men. Small amounts of necklace components are found, but very rarely are multiples of the same class found. Therefore a Viking might wear a Thor’s Hammer, but not usually an axe head pendant alongside a miniature scythe and Thor’s Hammer. The exceptions to this are beads, and two or three beads worn with an amulet pendant would not seem out of place. However, large strings of beads are not found and more than 3 beads together is exceptionally rare (see footnote 4). One element that is apparently completely absent from male Viking necklaces is an organic component. There are no records of perforated antler tines, animal teeth, carved bone pendants or anything similar. Skeletal materials tend to survive quite well (as testified by the presence of skeletons in graves and artefacts such as combs), so there is no reason to believe this should be taken as anything other than demonstrating a lack of utilisation of such objects. Another element that is absent is the wearing of touchstones, or “pendant” whetstones. While there are many perforated examples of these objects, there is no solid evidence to suggest that they were worn around the neck rather than on a belt. In fact, in archaeological reports and various surveys of such items, any time the position of a stone in the grave is mentioned, it is around the waist as if hanging from a belt. This is not to say that a hone or touchstone was never worn around the neck for ease, but if so it was seemingly a purely practical action with no decorative function or amuletic overtones i.e. the stone should not be worn as part of a necklace assemblage. The same also applies to the wearing of small knives on a cord around the neck; none appear to have been found, but as a practical possibility it cannot be discounted. So while it is true that Viking women did indeed wear many beads and it has even been recorded that the use of neck adornments was a display of the wealth of their husband, the men tended to not wear very much in the way of necklaces. An acceptable necklace for a male Viking should be considered as something comprising no more than 2-3 beads and possibly an amulet suspended on a leather or textile cord. Certainly the massive multi-bead necklaces strung with teeth, antler tines, pendants etc, and massive decorative hammers worn on silver chains have no provenance in the archaeological record and there is no apparent written evidence or depictions of such things being worn by men. Arbman, H., 1940. Birka 1: Die Gräber, Tafeln. Stockholm, Sweden, Almquist & Wiksell Internat. Batey, C., and Paterson, C., 2012. “A Viking burial at Balnakeil, Sutherland”. In Reynolds, A. & Webster, L. (eds.) Early Medieval Art and Archaeology in the Northern World: Studies in Honour of James Graham-Campbell. Series: Northern World (58). Brill, Leiden, Netherlands, pp. 631-659. Biddle, M., & Kjølbye-Biddle, B. (1992). Repton and the Vikings. Antiquity , 66, 36-51. Gräslund, A.S., 1992. “Thor’s hammers, pendant crosses and other amulets” in Roesdahl E & Wilson D.M (eds). From Viking to Crusader: The Scandinavians and Europe 800-1200.New York, Rizzoli. pp. 190-191. Heyerdahl-Larsen, B., 1999. ”Perler. Tilvirkning, proveniens” in; Blindheim, C., Heyerdahl-Larsen, B., & Ingstad, A. S. (eds) Kaupang-Funnene. Undersøkelsene 1950-1957, Bind 2, Bind 2. Oslo, Universitetets Kulturhistoriske Museer, Oldsaksamlingen. Jesch, J. 2003. Women in the Viking age. Woodbridge, Suffolk, Boydell Press. Paterson, C., Parsons, A. J., Newman, R. M., Johnson, N., & David, C. H., 2014. Shadows in the sand: excavation of a Viking-age cemetery at Cumwhitton, Cumbria. (Jensen, 2010) the survey used anatomical and grave-good evidence to determine the gender of 136 graves, of these only 15 were male. (Jensen 2010, p107 and table 5.2.10) however, as noted previously, the sample is quite small. E.g. (Petré, 1993) tables on pages 152-153 show that while neck rings are present in female graves during the Migration, Vendel and Viking periods, no male graves in his survey have any neck rings. While this is just a small sample from one area, I could not find a single male Viking grave with a neck ring. As with neck-rings there appears to be no examples of pendants found in male contexts that were attached to wire chains, trichinopoly etc, any time such metalwork was mentioned it either accompanied a female skeleton in a double burial or was associated with clothing trim. I’m enjoying your blog. Since reading your very thorough and thoughtful post on Vikings and jewelry, I wondered if you had any resources that can shed light on the Viking male’s wearing of finger rings, and if so, what type were most common. I don’t have a lot of info to hand on the matter, but if you check my new post you will see it is probably going on the “to-do” list. Thank you for this precise and professional article about men’s neck jewelry. Would you also like to concider writing a similar article about other types of men’s jewelry (especially rings and finger jewelry or/and braclets), based on male grave findings form Viking area and early medieval Rus’? I and many other re-enactors would be grateful. I was at Corfe castle a couple of weeks ago and saw many of the Viking men there wearing necklaces with lots of beads, teeth etc. There was even one with about 5 necklaces including crosses and thor’s hammers! You may find it interesting – there’s a Viking male burial from Dublin (Ship street) that contained a glass bead with a zig-zag decoration in the buried man’s neck area. The grave contained as well a copper alloy finger ring, a small copper alloy wire brooch and a corroded fragment of a pattern-welded sword blade. Info from ‘Viking Age Dublin’ by Ruth Johnson. Recently met a Viking reenacter and found your site on an Internet trawl. I have to say your writing/logic is very good/well considered. Just wondered if there’s enough detail from grave excavations to determine bead orientation? Vertical orientation would seem to point to beads being used to fasten garments, whilst a horizontal orientation would seem to be more in line with beads being used as jewellery, presumably secured by a thong/thread of some kind. Having trained as a jeweller when I was younger, done a fair bit of wood turning, and also done some antler/bone carving, I have to say your posts are very well written. Great balance between being factually accurate whilst having that touch of humanity and first-hand experience. Would be more than happy to see more post from you! Much appreciated!